Note: If the Startup Source Search setting in the Extended menu is enabled, the projector automatically detects the input signal when you turn it on. Plug the power cord into an electrical outlet. The projector's power light turns orange. 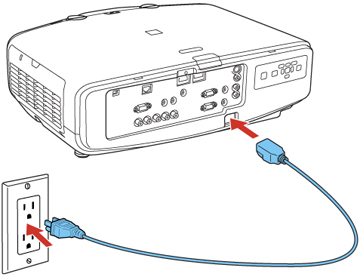 This indicates that the projector is receiving power, but is not yet turned on (it is in standby mode). Press the power button on the projector or the remote control to turn on the projector. The projector beeps and the power light flashes green as the projector warms up. After about 30 seconds, the power light stops flashing and turns green. Warning: Never look into the projector lens when the lamp is on. This can damage your eyes and is especially dangerous for children and pets. Insert a DVD or other video media, and press the play button (if necessary).